Sitting high on a hill this charming very spacious 4 bedroom villa offers spectacular, panoramic views of the Adriatic Coast, mountains, cities and country side and all with close proximity to everything that you may need for both a relaxing and active experience. For a list of things to see and do in the surrounding area. With only a short flight away from London, Paris, Berlin, Frankfurt and other key European and Italian cities you land at Pescara airport and with a 20 minute drive from the airport you will arrive at the 600Sqm villa that sits on its own 50,000Sqm private land. 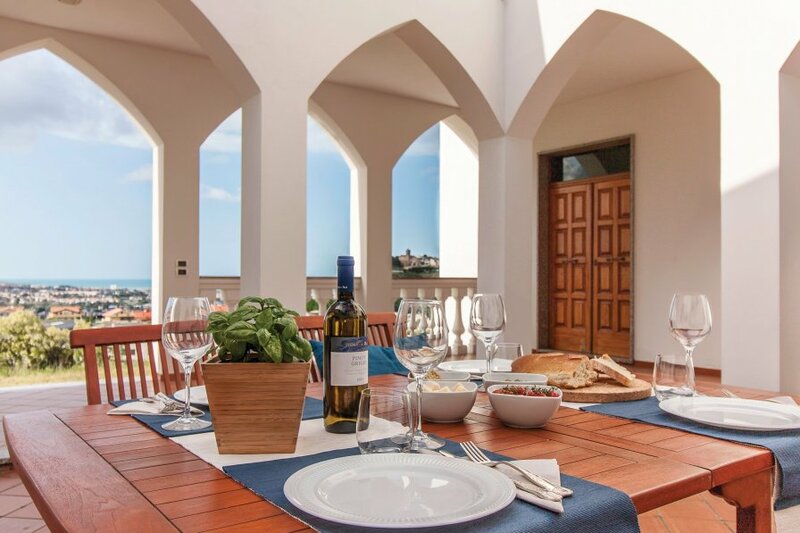 Surrounded by dramatic scenery, privacy, wonderful beauty, fresh air, Villa Adriatica is close proximity to vast stretches of beaches, great Italian shopping, nightlife and conveniently close to the Pescara airport and Pescara train station. For a list of things to see and do in the surrounding area. The interior is very spacious with high ceilings, yet is inviting and cozy and full of natural light. The ground floor consists of 4 spacious bedrooms: 1 large master bedroom with an en suite Jacuzzi bathroom and dressing room as well as 3 other bedrooms each with their own en suite bathroom. The centre of Pescara, with its designer and high street shops, is a 10-minute drive from the villa and there are also some best kept secrets where you can purchase designer fashion from designer factory outlets at heavily discounted prices. The beach is also a 10 minutes drive away, and if you like you can take a day trip and explore the islands of Isole Tremiti. For a list of things to see and do in the surrounding area. Small charming characteristic towns, open markets and local festivals in the nearby area are ideal for day trips to explore. And in the evenings, the beach cafes and the old town of Pescara Porto transform themselves into vibrant night spots. Or if you like you can even catch a bus, train or drive on the “Auto Strada” to Rome for a day trip which takes only around 2 hours to get there! The mountain range also known as "La Bella Dormentata" (The Sleeping Beauty) is 40 mins away and can be seen from the villa and Abruzzos extensive park system includes natural beauty akin to national parks in the western United States. Within Abruzzos parks lie some of Italys most beautiful ancient hill towns rivaling those of Tuscany and Umbria. The region has 15 ski resorts with 368 km of runs in 172 different ski tracks, all within a drive away. The most popular resorts are Roccaraso, Campo Felice, Campo Imperatore. Located on the highest altitudes of the Apennines, these ski areas are at heights nearly comparable to many resorts in the Alps. Because of their proximity to the Adriatic and winter precipitation patterns, they often have more snow than the Alps. Abruzzo also is popular for cross country skiing, especially on the high plain of Campo Imperatore in the Gran Sasso as well as the Piana Grande in the Majella. Let us know if you have any other questions and we will be more than happy to help you have a great experience at Villa Adriatica. Sitting high on a hill this villa offers, panoramic views of the Adriatic Coast, mountains, cities and country side.